Every morning when I scatter birdseed on the ground for the quail and other birds, several Desert Cottontails (Sylvilagus audubonii) are lurking nearby, watching and waiting. These Desert Cottontails have become quite tame, and they eagerly hop out from under the large agave where they like to hide and come right up to me to be the first to get some of the birdseed. Besides birdseed, Desert Cottontails also love grass and can often be seen grazing on lawns or golf courses early in the morning. These desert rabbits are commonly called Cottontails because their short tails look like fluffy, white cotton balls. 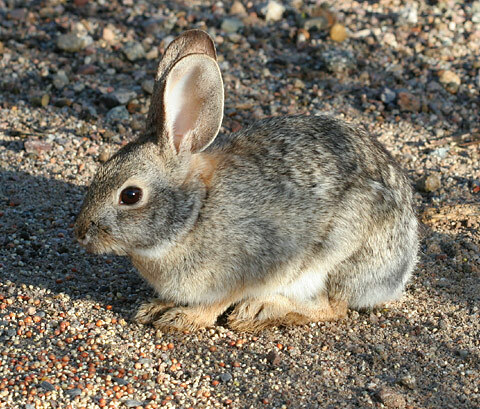 Desert Cottontails are an important prey species here in the Sonoran Desert, and their predators include large hawks, Great Horned Owls, Bobcats, and Coyotes. When chased by a predator like a dog or Coyote, Desert Cottontails will zigzag back and forth through the bushes as they run away and then dive for cover and hide there motionless. In dense desert vegetation, this confuses canines which tend to only be able to follow fleeing prey running in a straight line. Because Desert Cottontails don't have a strong odor and canine eyes are sensitive only to motion and not fine detail, a motionless Desert Cottontail can often escape detection. Of course, all it takes is one mistake by a Desert Cottontail and it's someone's meal.